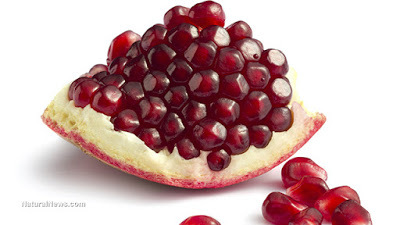 There is a strong case here for including pomegranates in your diet. We already know about its cardiovascular benefits and now we are aware that it also suppresses cancer stem cells as well. . I think we need to simply use the fruit directly. i suggest that you break out a section equal to a quarter of the fruit each day to consume. It is a nice treat. I have personally worked up a daily protocol that now used both papaya and pineapple. Thus fitting in a little pomegrante is not difficult. What i do is slice the top of the pineapple of and then cut of a one ich or less disc. I do the same with the papaya leaving the balance unseeded. The fruit goes back into the ridge for tomorrow. The two slices are then easily trimmed of their peel and then cut into small pieces for consumption. Wastage is minimal and a fresh slice is pulled every day. This easily lasts a week which is actually cost effective.. So adding a quarter of a pomegranate is good. Millions die every year from cancer. Millions more from heart disease. But a solid body of research indicates that consuming pomegranate may be the ideal way to protect yourself against the top two killers in the postmodern age. I’ve written and lectured previously on foods with life-saving properties, such as garlic, lime juice, and of course the amazing spice turmeric to which I have dedicated an entire resource page on GreenMedInfo.com. But I think what intrigues me most about pomegranate is how seldom it is recognized for its powerful, and I would say, life-saving health properties; this, despite the fact that the research literature shows it has 100+ potential health applications. This situation is not accidental. The truth about pomegranate (and all “natural cures” for that matter) is controversial and highly politicized, with the FTC and FDA going as far as filing complaints against pomegranate juice manufacturers for referencing its well-established health value. Regular readers know that we focus heavily on identifying the true causes and cures for cancer, as well as the still widely underestimated problem of the medical industry’s routine misclassification, overdiagnosis and overtreatment of cancer; a problem, in fact, which was recognized by the National Cancer Institute’s own expert panel in 2013 to apply to two of the most commonly diagnosed forms of cancer in men (HGPIN “prostate cancer”) and women (DCIS “breast cancer”), and which has lead to incalculable and needless suffering in millions of men and women in the U.S. over the past 30 years. The most common criticism against preliminary research like this is that since it has not yet been proven safe and effective in human clinical trials it would be irresponsible, if not illegal, to use it to prevent, mitigate or treat any disease. This criticism, however, belies naivety as to how the biomedical research and publishing industries really work. The funding pay that needs to be scaled in order to perform the phase I, II, II, etc. human clinical trials required by the FDA to obtain drug approval is between 1-11 billion dollars. Do we wait, for instance, for these studies to be performed, knowing full well that sufficient private and/or public capital will never materialize because natural substances do not produce market exclusivity nor a return on investment? In the meantime, tens of thousands die, annually, from the adverse effects of the highly toxic and ineffective conventional treatments. For additional research on Cancer Stem Cell Killing foods and spices, visit GreenMedInfo’s database section on the topic, or read my recent article on the topic: 25 Cancer Stem Cell Killing Foods Smarter Than Chemo.